SDY-001 15025844 Mystical Elf Spellcaster LIGHT 4 800 2000 A delicate elf that lacks offense, but has a terrific defense backed by mystical power. SDY-002 41392891 Feral Imp Fiend DARK 4 1300 1400 A playful little fiend that lurks in the dark, waiting to attack an unwary enemy. SDY-003 87796900 Winged Dragon,Guardian of the Fortress #1 Dragon WIND 4 1400 1200 A dragon commonly found guarding mountain fortresses. Its signature attack is a sweeping dive from out of the blue. SDY-004 70781052 Summoned Skull Fiend DARK 6 2500 1200 A fiend with dark powers for confusing the enemy. Among the Fiend-Type monsters, this monster boasts considerable force. SDY-005 32452818 Beaver Warrior Beast-Warrior EARTH 4 1200 1500 What this creature lacks in size it makes up for in defense when battling in the prairie. SDY-007 06368038 Gaia The Fierce Knight Warrior EARTH 7 2300 2100 A knight whose horse travels faster than the wind. His battle-charge is a force to be reckoned with. SDY-008 28279543 Curse of Dragon Dragon DARK 5 2000 1500 A wicked dragon that taps into dark forces to execute a powerful attack. SDY-009 91152256 Celtic Guardian Warrior EARTH 4 1400 1200 An elf who learned to wield a sword, he baffles enemies with lightning-swift attacks. SDY-010 40374923 Mammoth Graveyard Dinosaur EARTH 3 1200 800 A mammoth that protects the graves of its pack and is absolutely merciless when facing grave-robbers. SDY-011 13429800 Great White Fish WATER 4 1600 800 A giant white shark with razor-sharp teeth. SDY-012 90357090 Silver Fang Beast EARTH 3 1200 800 A snow wolf that's beautiful to the eye, but absolutely vicious in battle. SDY-013 13039848 Giant Soldier of Stone Rock EARTH 3 1300 2000 A giant warrior made of stone. A punch from this creature has earth-shaking results. SDY-014 66672569 Dragon Zombie Zombie DARK 3 1600 0 A dragon revived by sorcery. Its breath is highly corrosive. SDY-015 16972957 Doma The Angel of Silence Fairy DARK 5 1600 1400 This fairy rules over death, and administers it when necessary. SDY-016 48365709 Ansatsu Warrior EARTH 5 1700 1200 A silent and deadly warrior specializing in assassinations. SDY-017 36304921 Witty Phantom Fiend DARK 4 1400 1300 Dressed in a night-black tuxedo, this creature presides over death. SDY-018 41218256 Claw Reacher Fiend DARK 3 1000 800 Stretching arms and razor-sharp claws make this monster a formidable opponent. SDY-019 47060154 Mystic Clown Fiend DARK 4 1500 1000 Nothing can stop the mad attack of this powerful creature. SDY-020 37120512 Sword of Dark Destruction Magic Card MAGIC A DARK monster equipped with this card increases its ATK by 400 points and decreases its DEF by 200 points. SDY-021 91595718 Book of Secret Arts Magic Card MAGIC A Spellcaster-Type monster equipped with this card increases its ATK and DEF by 300 points. SDY-022 53129443 Dark Hole Magic Card MAGIC Destroys all monsters on the field. SDY-023 Dian Keto the Cure Master Magic Card MAGIC Increases your Life Points by 1000 points. SDY-024 93221206 Ancient Elf Spellcaster LIGHT 4 1450 1200 This elf is rumored to have lived for thousands of years. He leads an army of spirits against his enemies. SDY-025 46474915 Magical Ghost Zombie DARK 4 1300 1400 This creature casts a spell of terror and confusion just before attacking its enemies. SDY-026 66788016 Fissure Magic Card MAGIC Destroys 1 face-up monster with the lowest ATK. SDY-027 04206964 Trap Hole Trap Card TRAP If the ATK of a monster summoned by your opponent (excluding Special Summon) is 1000 points or more, the monster is destroyed. SDY-028 83887306 Two-Pronged Attack Trap Card TRAP Select and destroy 2 of your monsters and 1 of your opponent's monsters. SDY-029 19159413 De-Spell Magic Card MAGIC Destroys 1 Magic Card on the field. If this card's target is face-down, flip it face-up. If the card is a Magic Card, it is destroyed. If not, it is returned to its face-down position. The flipped card is not activated. SDY-030 83764718 Monster Reborn Magic Card MAGIC Select 1 Monster Card from either your opponent's or your own Graveyard and place it on the field under your control in Attack or Defense Position (face-up). This is considered a Special Summon. SDY-031 17814387 Reinforcements Trap Card TRAP Increase 1 selected monster's ATK by 500 points during the turn this card is activated. SDY-032 04031928 Change of Heart Magic Card MAGIC Select and control 1 opposing monster (regardless of position) on the field until the end of your turn. SDY-033 87557188 The Stern Mystic Spellcaster/Effect LIGHT 4 1500 1200 FLIP: All face-down cards on the field are turned face-up, and then returned to their original positions. No card effects are activated when cards are turned face-up. SDY-034 13945283 Wall of Illusion Fiend DARK 4 1000 1850 The monster attacking this creature is returned to its owner's hand. Any damage resulting from the attack is calculated normally. SDY-035 50930991 Neo the Magic Swordsman Spellcaster LIGHT 4 1700 1000 A dimensional drifter who not only practices sorcery, but is also a sword and martial arts master. SDY-036 86325596 Baron of the Fiend Sword Fiend DARK 4 1550 800 An aristocrat who wields a sword possessed by a malicious spirit that preys on the weak. SDY-037 13723605 Man-Eating Treasure Chest Fiend DARK 4 1600 1000 A monster disguised as a treasure chest that is known to attack the unwary adventurer. SDY-038 49218300 Sorcerer of the Doomed Spellcaster DARK 4 1450 1200 A slave of the dark arts, this sorcerer is a master of death-dealing spells. SDY-039 85602018 Last Will Magic Card MAGIC If a monster of yours is sent from the field to the Graveyard during the turn that you've played this card, you can select a monster with an ATK of 1500 points or less from your Deck and play it as a Special Summon. Shuffle the Deck after playing the card. This card is active for 1 turn only. SDY-040 12607053 Waboku Trap Card TRAP Any damage inflicted by an opponent's monster is decreased to 0 during the turn this card is activated. SDY-043 46461247 Trap Master Warrior/Effect EARTH 3 500 1100 FLIP: Destroys 1 Trap Card on the field. If this card's target is face-down, flip it face-up. If the card is a Trap Card, it is destroyed. If not, it is returned to its face-down position. The flipped card is not activated. SDY-044 50045299 Dragon Capture Jar Trap Card TRAP All Dragon-Type monsters on the field are switched to Defense Position and remain in this position as long as this card is active. 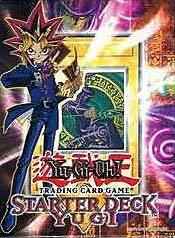 SDY-045 59197169 Yami Magic Card MAGIC Increases the ATK and DEF of all Fiend and Spellcaster-Type monsters by 200 points. Also decreases the ATK and DEF of all Fairy-Type monsters by 200 points. SDY-046 54652250 Man-Eater Bug Insect/Effect EARTH 2 450 600 FLIP: Destroys 1 monster on the field (regardless of position). SDY-047 77622396 Reverse Trap Trap Card TRAP All increases and decreases to ATK and DEF are reversed for the turn in which this card is activated. SDY-048 51482758 Remove Trap Magic Card MAGIC Destroys 1 face-up Trap Card on the field. SDY-049 44209392 Castle Walls Trap Card TRAP Increase a selected monster's DEF by 500 points during the turn this card is activated. SDY-050 80604091 Ultimate Offering Trap Card TRAP At the cost of 500 Life Points per monster, a player is allowed an extra Normal Summon, Tribute Summon, or Set.